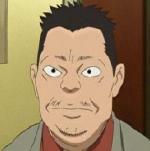 Akio Kawazu is a freelance journalist. Heavy in debt to pay for the hospital bills of an elderly man that was hit by Kawazu's car, Akio struggles to find a big story. He is not in good standing with the local police however, as Maniwa and Ikari mock his less than honorable journalistic integrity. After Tsukiko Sagi was attacked by Shounen Bat/Lil' Slugger, Kawazu began following Tsukiko, desperate for anything that could make a good story. He is not above looking up Tsukiko's skirt, given the chance.